Sports Logging & Media Asset Management Unified by Arvato Systems and Dixon Sports Computing | Arvato Systems | IT Strategy. Solutions. Innovation. "Telling the Story of the Game." As sports media companies are aware, sporting events produce huge amounts of valuable content. Exploiting and monetizing content without being overwhelmed by the volume is the key goal for sports media companies. With this in mind, arvato Systems and Dixon Sports Computing announce their integrated solution for sports logging and media asset management. 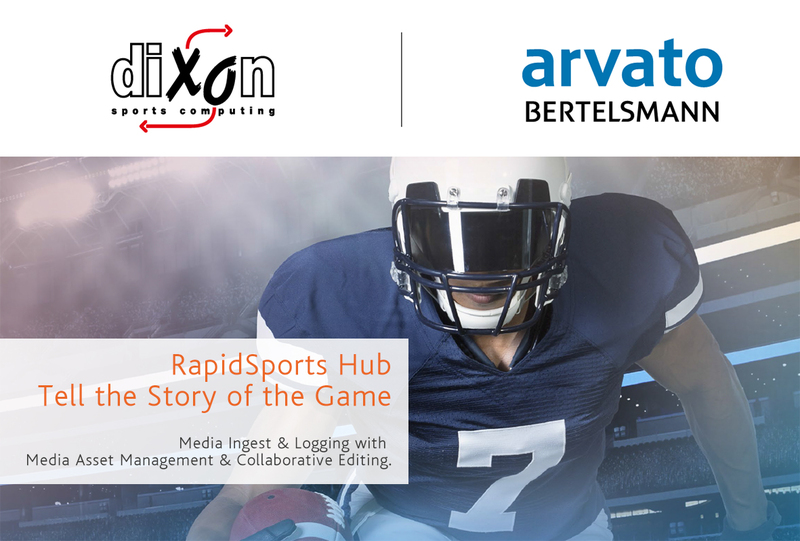 New York, NY, December 10, 2015	(Newswire.com) - ​The RapidSports Hub solution, integrating best of breed products from both arvato Systems and Dixon Sports Computing has been designed with precisely these objectives in mind. With over 17 years of experience covering major sporting events, Dixon Sports Computing is the world leader in logging and managing sports video. Dixon's sports loggers are known to make in-depth logging easy and fast. Working together, the solutions provide unprecedented control, reliability, and performance in capturing metadata and assets. RapidSports Hub delivers intelligent metadata capture and logging augmented by external data feeds, processing and management of all video assets and workflows, web based user interfaces with drag-and-drop functionality for rapid execution, and integration to existing broadcasting environments and equipment. As a global next generation IT systems integrator arvato Systems focuses on solutions for the "Digital Transformation”. With the talent and technology of over 3,000 people in 25 locations around the world, arvato Systems is an industry leader with media end-to-end solutions. From within the arvato network of companies, as a part of the Bertelsmann concern, we create future-proof, international value chains and infrastructures that make our customers agile and competitive. In addition to delivering streamlined digital processes that enable innovative business models, we stand by our customers with operation and support services. arvato Systems offers an exceptional combination of IT engineering excellence, the open mindset of a global player, and the dedication of its employees as we we work to ensure that all our customer relationships are as rewarding as they are successful. With its cutting-edge staff and over 17 years of experience covering major sporting events, Dixon Sports Computing is the world leader in logging and managing sports video. Dixon's sports loggers make in-depth logging easy and fast. We have a full range of workflow products to quickly get video where it's needed and in the right format. Dixon's customer base include top networks, sports teams and companies in the world.